The Star Wars Jedi: Fallen Order release date is official: you can start playing through Respawn Entertainment's Force-powered action adventure on November 15, 2019. The panel at Star Wars Celebration 2019 also confirmed that the game is headed to PC, PS4, and Xbox One simultaneously. 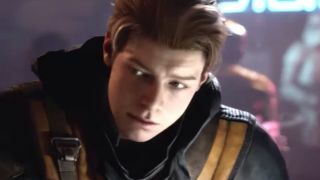 The news came alongside the debut of the Star Wars Jedi: Fallen Order trailer, which finally gave us our proper introduction to Cal Kestis, a former padawan who now must hide his powers and history from agents of the Jedi-hunting Imperial Inquisition. EA had previously announced that Star Wars Jedi: Fallen Order would arrive sometime in "Holiday 2019", so this official announcement falls squarely within that window. It may seem like a pretty fast turnaround, given that the game was only officially announced back at E3 2018. It's actually been cooking at Respawn Entertainment ever since 2014, when game director Stig Asmussen (who you may know for leading work on God of War 3) joined the studio. If you're curious about what buying decisions you'll be making on November 15, 2019, Star Wars Jedi: Fallen Order is actually the first major video game release date to be marked for that day. It probably won't stay that way for long - it's some pretty prime real estate smack dab in the middle of holiday shopping season - but on the other hand, I wouldn't be surprised if some other games quietly shuffle their unannounced plans by a week or two in response. Can't imagine anybody wants to go toe-to-toe with the most-anticipated Star Wars game in recent memory. Read through our Star Wars 9 trailer breakdown for a different kind of Star Wars inquisition. Or watch our video walkthrough of the Star Wars timeline and see how it all fits together.